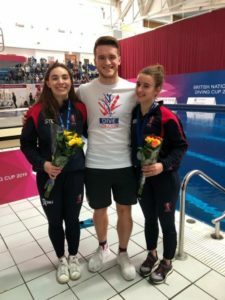 Divers from Dive London competed at the British National Diving Cup in Plymouth over the weekend of the 1st to 3rd of February 2019. Over the three days they were very successful bringing home a stunning 13 medals between them! The first medal of the National Cup for Dive London went to Grace Reid, who took Silver in Women’s 1m. Next was the Women’s 10m synchro, in which Robyn Birch and Synchro partner Gemma MacArthur won the Bronze. 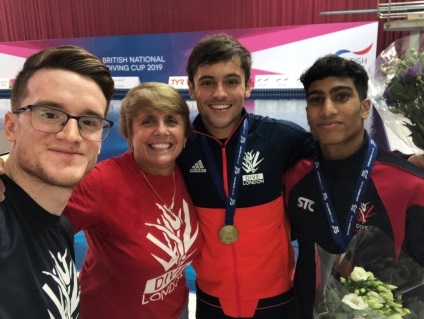 An amazing few results in the Men’s 3m synchro, with Gold for Tom Daley & partner Matty Lee , Silver for Ben Cutmore & partner Lucas Thomson and Bronze for Noah Williams & Kyle Kothari. 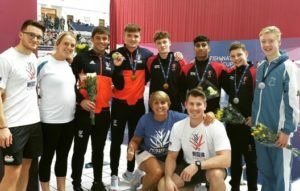 Fantastic performance from the Dive London Boys to be filling the podium! Gold for Grace Reid & partner Katherine Torrance in the Women’s 3m Synchro, followed closely in second by Dive London’s Scarlett Mew Jensen and Maria Papworth. Tom Daley managed Gold in the Men’s 10m Platform Final. Kyle Kothari also took home the Bronze medal! Finally, Scarlett and Maria won Silver and Bronze in Women’s 3m Final. A fantastic performance from the Dive London Team!